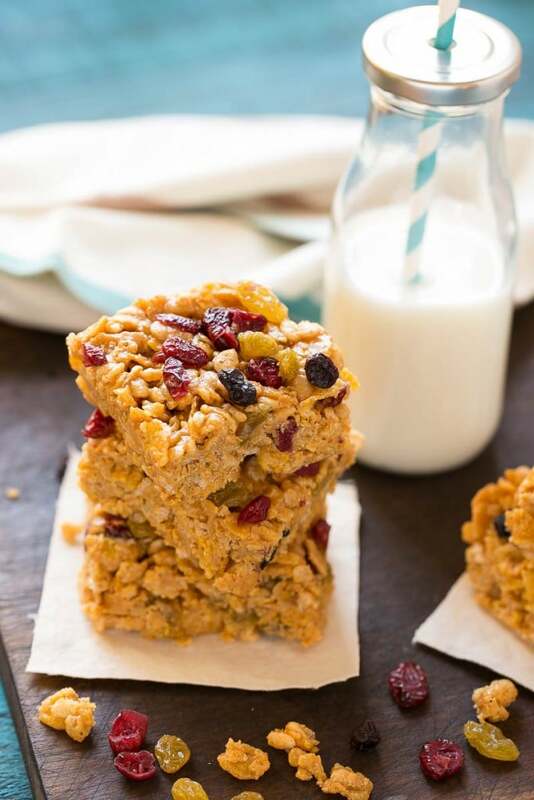 These no bake breakfast cereal bars are made with cereal, peanut butter, honey and dried fruit. It’s a quick and easy breakfast option that the kids will love! 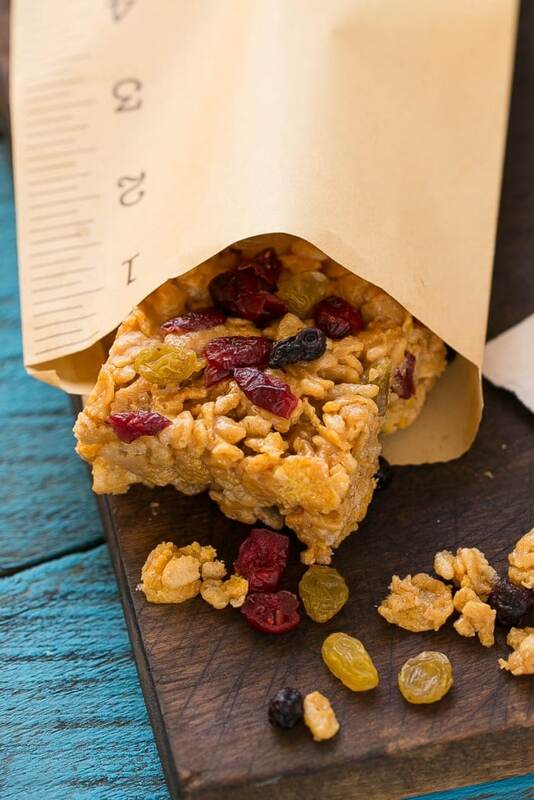 I’m always looking for grab and go breakfast options to keep the kids well fueled in the morning, and these cereal bars are one of their favorites! Trying to get three kids aged 4 and under out the door in the mornings is no easy task. I try and be as organized as possible so that no time is wasted, and part of that means preparing breakfast in advance. 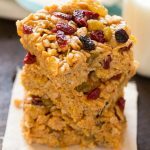 I created these no-bake breakfast cereal bars as a grab-and-go option for the days when there’s just no time to sit around the table and have a leisurely meal. Best of all, the bars are full of nutrients and only contain 5 ingredients. 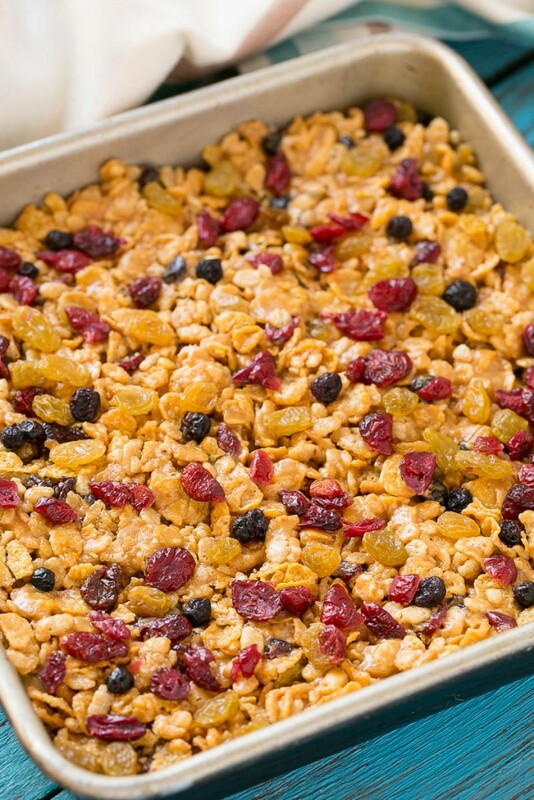 My kids love cereal, so I used some of their favorites as a base for these no-bake cereal bars. I picked up boxes of Kellogg’s Rice Krispies and Frosted Flakes in the cereal aisle at Target, these particular cereals give the bars great texture and crunch. How do you make cereal bars? 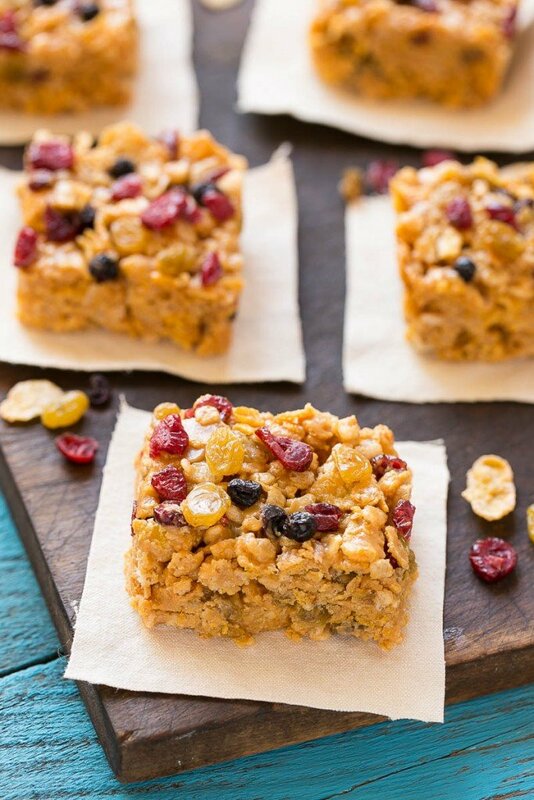 These no-bake cereal bars only have 5 ingredients: Rice Krispies, Frosted Flakes, peanut butter, honey and your favorite dried fruit. I used a dried berry blend that my kids love. The cereal and most of the dried fruit get combined in a bowl – you’ll want to save some of the fruit to decorate the tops of the bars. In the meantime, honey gets heated in the microwave and mixed with peanut butter. 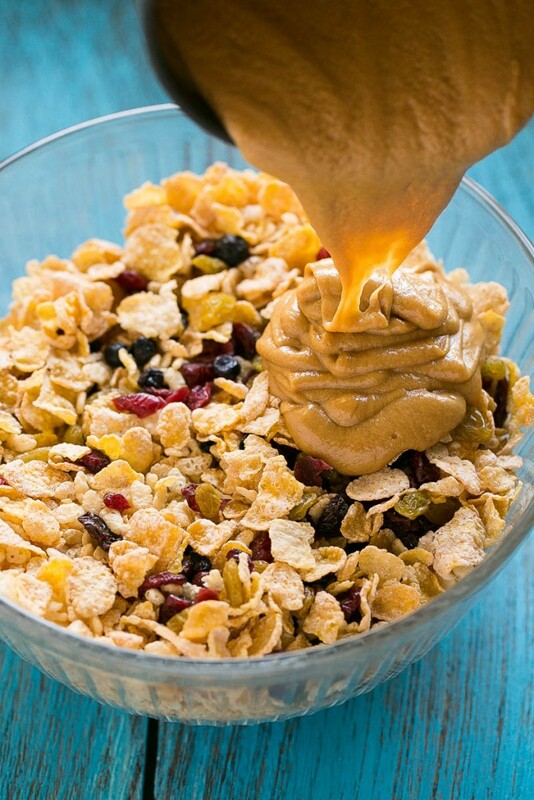 The peanut butter mixture gets poured into the bowl of cereal and fruit. After the cereal and peanut butter mixture is thoroughly combined, everything gets pressed into a greased pan. This is where the reserved dried fruit comes in, decorate away! The bars need to chill briefly so that they can firm up before you cut into them. I’d recommend chilling the bars for a minimum of 20 minutes. I like to make a batch of these bars the night before and leave them in the fridge so that I have a week’s worth of breakfasts at the ready. If you want to make them the same morning, just mix everything together first thing when you wake up, stick them in the fridge and the bars will be done when you’re ready to walk out the door. You can also make a big batch of cereal bars and put them individually wrapped into the freezer for future use. 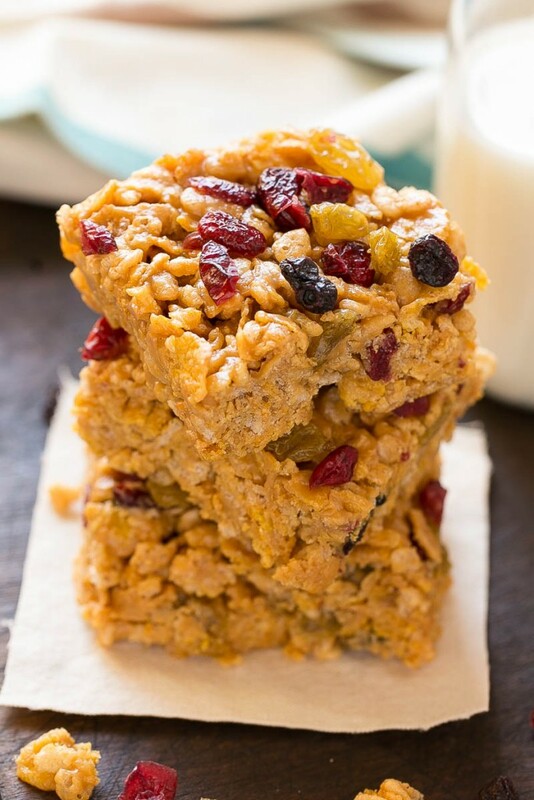 These no-bake breakfast cereal bars are a great way to feed your family in a hurry. The peanut butter adds a nice dose of protein and healthy fat to keep everyone full all morning long and the cereal is full of vitamins and minerals, making this a breakfast choice you can feel good about giving your kids. These bars are not just for the kids, my husband also likes to grab one on his way to work. 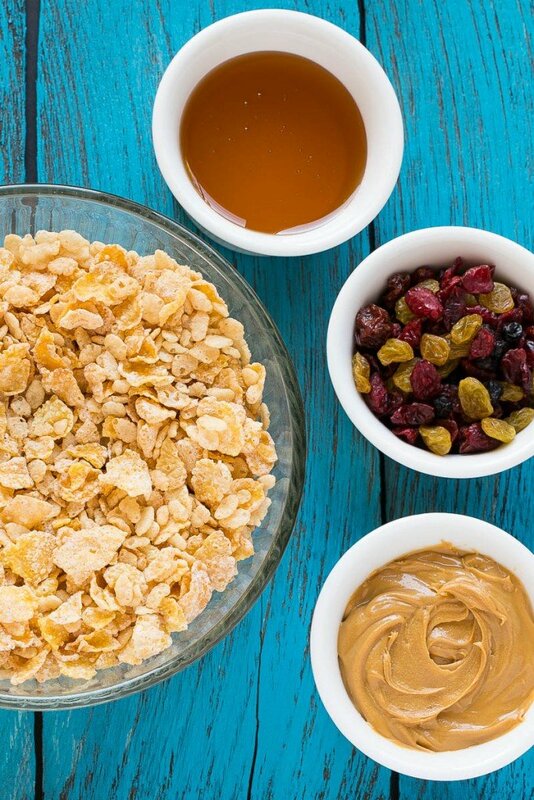 A no-bake breakfast cereal bar with just 5 ingredients. Mix together the cereals and 1/2 cup of dried fruit in a large bowl. Place the honey in a medium bowl and microwave for 1 minute. Remove from microwave and stir in the peanut butter into the mixture is smooth. Pour the peanut butter mixture into the bowl of cereal and fruit, mix thoroughly until cereal is coated in the peanut butter mixture. Firmly press the cereal mixture into an 8 or 9 inch square pan that has been coated in cooking spray. Press the remaining 1/4 cup of dried fruit into the top of the cereal mixture. Place the pan in the fridge and chill for at least 30 minutes. Cut into bars and serve. Make Ahead: The bars can be made up to 3 days in advance, store them in the fridge until you're ready to use them. Freeze It: The bars can be stored, individually wrapped, in the freezer for up to 2 months. Where did you get those gorgeous bags with the ruler printed on the side??? I got them at a local party goods store but this was a few years ago! 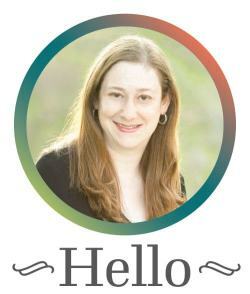 You may be able to find something similar from Amazon or Oriental Trading Company. These are great grab and go breakfast bars. I used almond butter in mine. Super tasty! Mine fell completely apart. Any idea what I did wrong? That’s odd, did you chill them? I used smooth Peter Pan. They stuck together but I was thinking more like rice Krispy bars. My 22 yr old son loved them and said make them again. I will measure more closely next time. After 1 minute in microwave the honey was about to boil over and it did mix nice. I also used special K very berry and Rasin brand crunch. As I said my son loved them. Is there a reason for microwaving the honey so long? My bars didn’t want to stay together but were good. Hi Debra, the reason for heating the honey is that you want it to be hot enough to thoroughly mix with the peanut butter. The honey/peanut butter mixture should be thin enough to coat all of the cereal and should firm back up as it cools. I’m sorry your bars didn’t hold together – what kind of peanut butter did you use? need to know total carbohydrates. Diabetic Looks good . Hi Marlene, it’s 35 grams of carbs per serving. do you know the amt of sugar per serving? Hi Jackie it’s 15 grams per serving, mostly from the honey and dried fruit. I LOVE the crunch of these! My kids would adore them! I am all for grab and go breakfasts. These sound delightful. Oh yum! Talk about EASY! These look great! Very clever. Do you think I could sneak in some sunflower seeds or maybe a nut? Mmm yes please. I would LOVE one of these for breakfast! I love that these utilize the microwave so there’s no large pot to clean. My family loves bars, so these will be a winner in my house. Mmmmm. Simple and delicious! A perfect snack for kids! My mom used to make brownies on Sunday mornings, she said the only way to get four kids out the door on time for church was to give us chocolate for breakfast. I was an adult before I really realized it is a dessert not a breakfast food! haha! I’m glad you found a yummy bar to get your crew going! It looks great! These would be such an easy grab-and-go snack, especially for busy mornings!